Yesterday was a fantastic sunny day, the nicest it has been for quite some time, so I put Nolan in the stroller and we walked over to the farmer’s market. There was so much beautiful produce that I really had to restrain myself, but I got a huge load of goodies for about $20, and Nolan got to see all the goings-on and sample some food. By the time we left, if I tried to point out a pretty flower or something, he automatically opened his mouth up wide for a bite. 🙂 I’m determined to make some good headway with scary vegetables this summer, so I bought mostly items that I don’t actually like very well: zucchini, fennel, mushrooms, and turnips. Plus a few pints of strawberries because I can’t resist them. The turnips and fennel came from a booth I didn’t recall seeing before, a certified organic Salem farm called Pitchfork and Crow. Their produce is gorgeous, and I really scored with the turnips because while we were there, another woman purchased some and asked to have the greens cut off. She clearly didn’t know what she’s missing out on, but I ended up walking away with four lovely purple-topped turnips and a vasty mountain of greens for $2.50. I had intended to get some kale or chard, but that will have to wait for another week. There’s something about breaking down produce (and to a lesser extent, meat) that really appeals to me. I think it is because, as a picky eater, I’m always trying to make my food pristine and uniform, free of textural oddities that I would find unappealing. Starting with whole produce allows me to remove every single offensive spot or fibrous stem, so I take my sweet time with it. For the turnip leaves, I weeded out all the really bug-eaten and yellowing leaves and ripped off the stems, slicing rolled stacks into ribbons and swirling it in a large container of cold water to wash off the dirt, and then I spun it all dry in my under-used salad spinner. 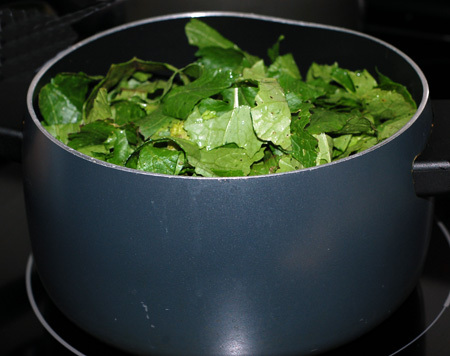 I was left with two large bowlfuls of greens, ready to use when I’m ready to cook them. And in case you were wondering whether it was necessary to fully submerge and soak the greens, the answer is yes, absolutely, unless you enjoy eating dirt. 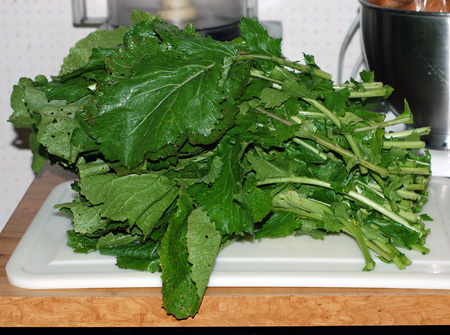 Turnip greens, like many dark leafy greens, are incredibly good for you, but they can be prickly and fibrous, and require some braising to break down. 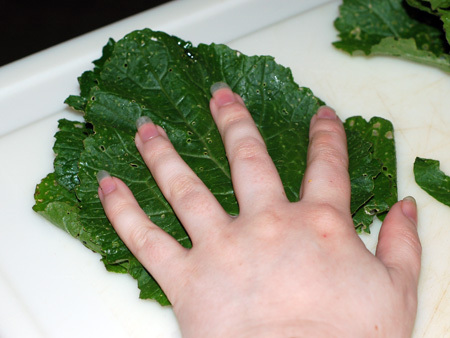 Because of this sturdiness, they maintain more body when cooked than spinach or chard, for instance, which can end up with a wet-tissue texture, but don’t require cooking quite as long as collards. 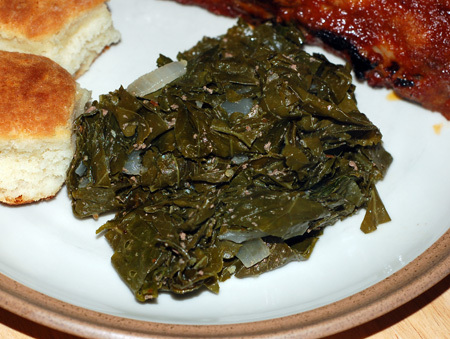 I decided to introduce myself to turnip greens by cooking half of them with a pretty traditional Southern method: you boil the greens twice to remove some of their bitterness, flavoring them with bacon grease and onion along the way. The result was more olive drab than green, but very tender and flavorful, with hints of bitterness and bite. I liked it, but I wanted a bit of acidity or sweetness for balance; next time I’ll experiment with a mixture of honey and cider vinegar, and maybe add some crunchy bacon or toasted pecans for crunch I can see why many similar recipes for greens pair them with black-eyed peas or diced turnip for a creamy contrast. I could also see a handful of blanched turnip greens making a seamless addition to a pot of red beans and rice. 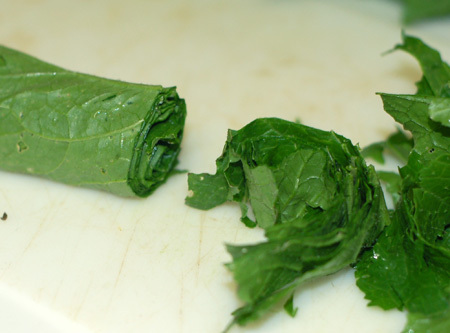 Remove the woody stems from the greens, then stack half a dozen leaves at a time, roll them into a tight log, and and slice into 1″ strips. 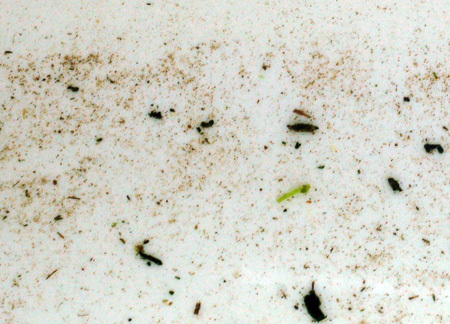 Wash the greens in several deep changes of water in a large container or the sink until no more grit is seen. 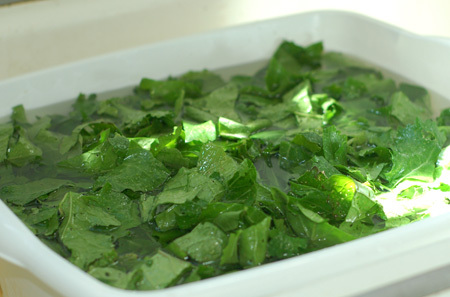 (To store greens, spin them dry with a salad spinner, then allow to sit in a colander for an hour or two, until any remaining surface water has evaporated. Store loosely in a plastic bag in your refrigerator’s vegetable drawer, for up to 3 days.) Place the greens in a pot large enough to hold them and cover with water; add a pinch of sugar and bring to a rolling boil, then drain. In the same pot, melt the bacon grease and saute the onion until tender. Return the greens to the pot, and add the turnip, lemon pepper, pepper flakes, nutmeg and salt. Add enough stock, water, or braising liquid (I was simultaneously braising boneless pork ribs for barbecue, so I used a combination of chicken stock and strained braising liquid from the pork). Return to a simmer and cook for about 15 minutes, until the greens are very tender. Unless you come from a school that drinks the pot likker, drain before serving.